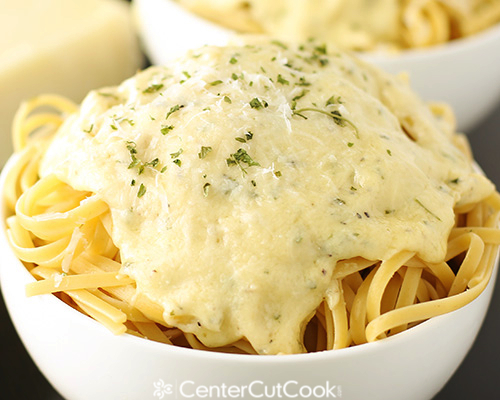 This Creamy Alfredo Sauce comes together in 20 minutes and is the perfect sauce for your favorite pasta whether it be fettuccine, linguini, or rotini. I’m pretty certain that the first time I ever experienced the deliciousness that is known as fettuccine alfredo I was at Olive Garden, probably during my Jr. High years. I remember not really knowing what alfredo sauce was, but my mom pointed it out as an option I’d probably like. She knew my tastes pretty well, and with alfredo sauce? She nailed it. One bite and I was sold! Forget the pasta fagioli soup, or the salad, any time we went to Olive Garden as a kid, it was all about the fettuccine alfredo. 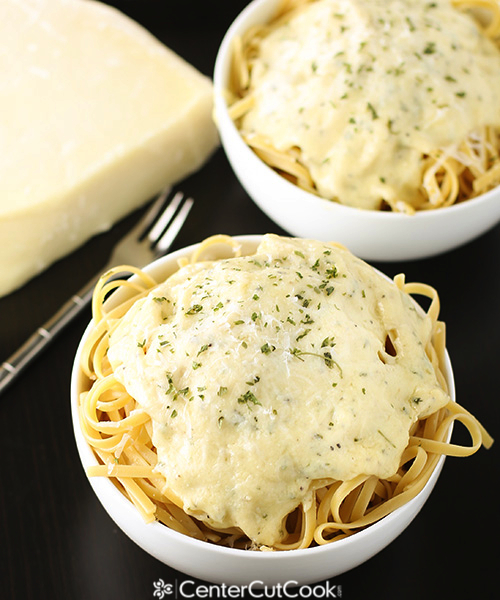 Now that I’m an adult, I’ve realized that there are actually some alfredo sauces that I enjoy more than Olive Garden *gasp*, like this Simple Creamy Alfredo Sauce made in 20 minutes with cream cheese, parmesan cheese, and a little half and half. Ever since I published it (Feb. ’12), I’ve gotten a couple of emails from some of you, asking if I had an alfredo sauce that didn’t include cream cheese. I promised I’d post a cream-cheese-free alfredo sauce that is equally as delicious for those of you who don’t like cream cheese, so here it is! 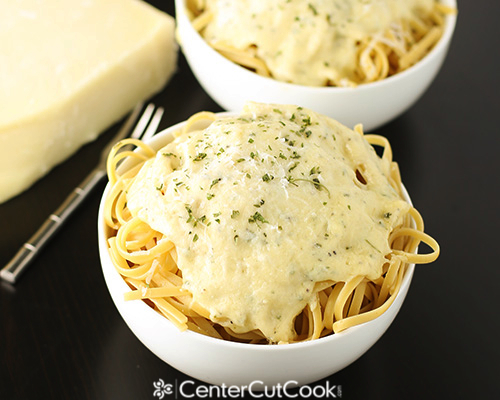 Parmesan cheese is typically the star ingredient in most alfredo sauces and this one is no exception. Creamy and delicious, this sauce requires only three main ingredients with an optional fourth ingredient, and it comes together FAST. 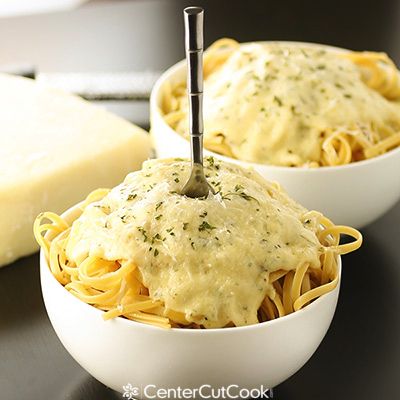 You’ll need butter, heavy cream (do not substitute milk), and parmesan cheese. Any time I am grating parmesan cheese, I always turn to my trusty microplane grater. Finely grated cheese incorporates into a sauce so much easier than if I use my standard box grater. The optional ingredient I mentioned earlier is garlic. You’re probably accustomed to using a knife to mince garlic, or even a garlic press. For this particular recipe, if you decide to include the garlic, you’re actually going to grate it with that microplane grater so that you’re left with really teeny tiny pieces. 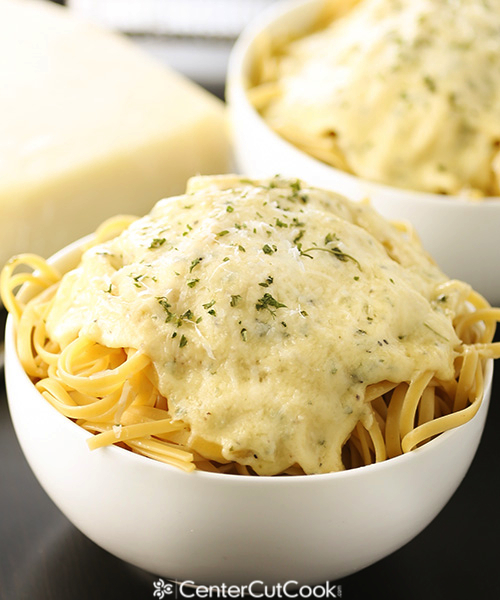 This time around I served this Creamy Alfredo sauce tossed with linguini, but you can choose any pasta that you’d like. I’m not crazy about the way it heats up as leftovers because the oil in the parmesan cheese tends to separate, so I’d recommend eating this fresh. Enjoy! Increase the heat a bit to medium high and add 1 cup heavy whipping cream. Bring the sauce to a gentle boil, then reduce the heat to medium low and simmer for about 10 minutes. As it simmers, the sauce will start to thicken. Stir in salt and black pepper to taste, parsley, and grated garlic. Reduce the heat to low, then stir in the finely grated parmesan cheese and continue stirring until all of the parmesan cheese has melted. Remove from the heat. Adjust salt and pepper as needed and serve immediately with the pasta of your choice.